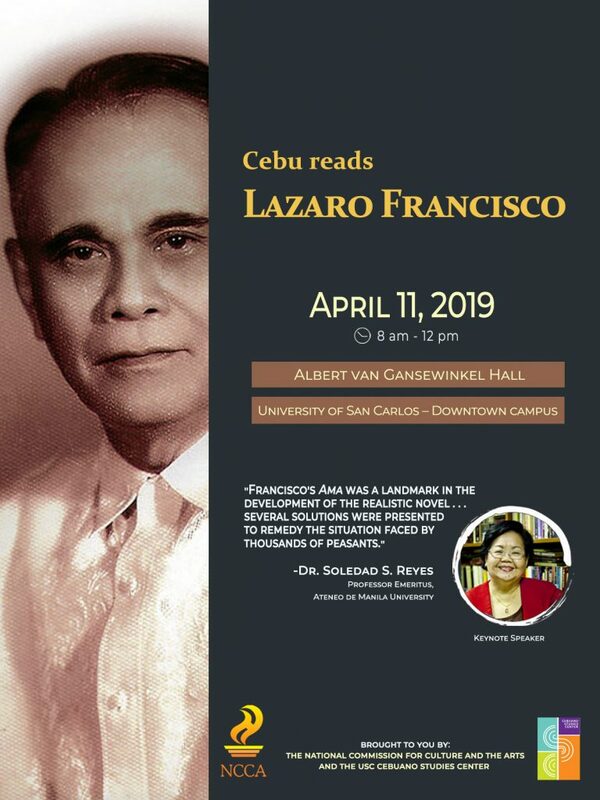 Still in line with the NLM celebration is an event dubbed as CEBU READS LAZARO FRANCISCO, to be held in the Fr. Albert Van Gansewinkel Hall in the University of San Carlos-Downtown Campus on 11 April 2019 from 8:00 am to 12:00 pm. Under the sponsorship of the NCCA, KWF, and the USC Cebuano Studies Center, in cooperation with the USC DCLL, this activity is a celebration of the works of National Artist Lazaro Francisco, who had written 12 novels in Filipino. Among his well-loved works are the Maganda pa ang daigdig (The world is still beautiful, 1955), Daluyong (The Surge,1962-1963), Sugat sa Alaala (Memory’s Wound, 1950-1951), Ilaw sa Hilaga (Northern Light, 1946-1947) and many others. The activity aims to introduce and showcase the Francisco’s genius to the contemporary generation of Filipinos, to encourage the youth to return and read the early meaningful Filipino writers in the different languages, and to foster understanding of the Filipino sense of identity that is based or centered on being Tagalog or being Manileño. The experience, depth, and importance of a Tagalog as Filipino will be tackled in the keynote of Dr. Soledad Reyes, Professor Emeritus of Ateneo De Manila University and primary critic of Lazaro Francisco’s works as well as in the critical discussions with invited scholars/critics who will discuss the oeuvre of Francisco. To present their papers are Haidee Emmie Palapar, Joanalyn Gabales, Francis Luis Torres, Niño Augustin Loyola, and Clyde Inso Chan. A dramatic reading of excerpts of Francisco’s work will be presented. The event will also be graced by the National Artist Resil B. Mojares, Professor Emeritus of the University of San Carlos.